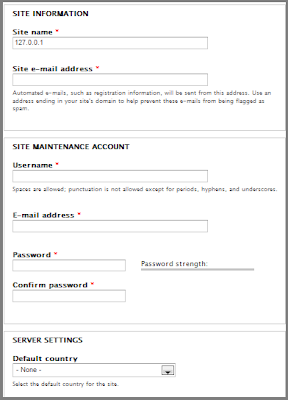 1) Here, I am assuming that you have Installed WAMP already, if not, then proceed to wampserver.com and download the latest version. 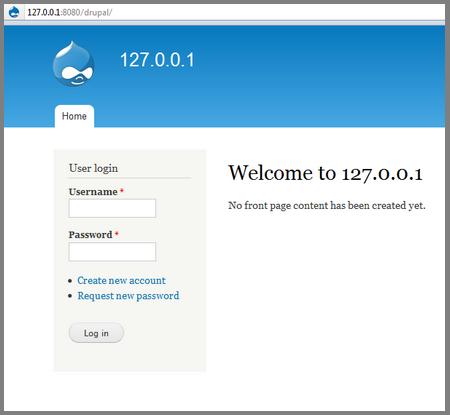 After the installation, launch it, type http://127.0.0.1 on your browser, and make sure you see the default screen. 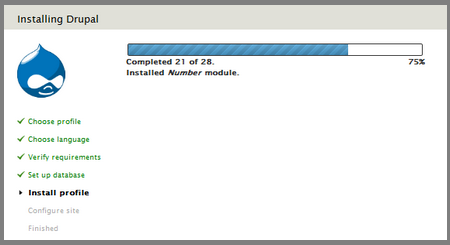 2) Download Drupal - I'm using the v7.14 .zip version. Unzip into a dir at: C:\wamp\www, for example: C:\wamp\www\drupal - where drupal is the main directory containing all the drupal files. 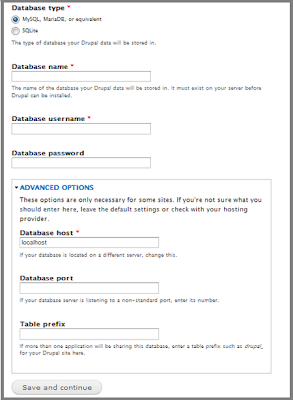 3) Create a database in WAMP using PHPMyadmin. You should have the following info ready:database name, username and password. 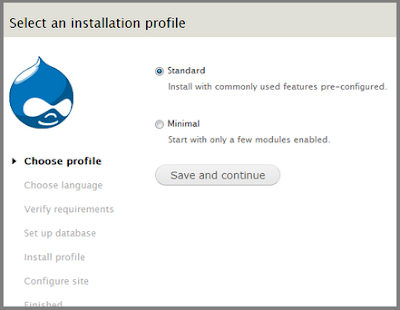 4) To begin installation, type: http://127.0.0.1/drupal. You should see a page displayed similar to the below. By the time we finish, all the processes at the left hand side must have a green-check mark. (a) Leave "standard" Radio button checked, click "save and continue". (b) Choose Language: "English" (built-in) is selected. Leave as is, click "Save and Continue". (c) Configuration: "MySQL....." is checked by default. Leave as it is. 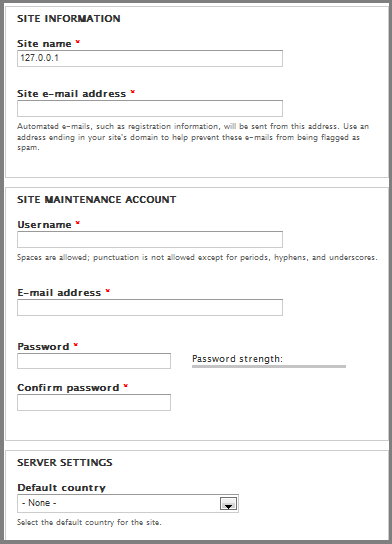 Type in your database name,username and password. Localhost is the default Database host. Leave as it is. Click "Save and Continue". If the information provided by you are all ok, the installation will begin automatically. 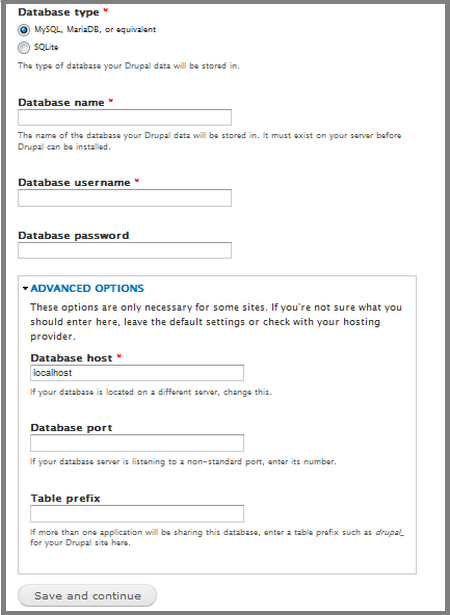 Username : the username/password with which you(administrator) want to access Drupal. * You could leave the rest of the settings as is / blank as we are on a local host. Now Click "Save and Continue". (e) Whooo!! 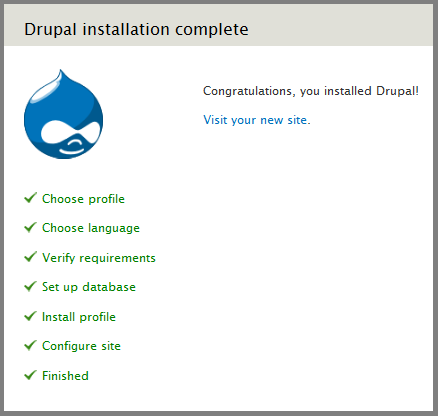 Drupal is successfully installed. Click "visit your new site" for Drupal's homepage.